The Cross Island Line (CRL) is a future high-capacity underground MRT line currently under planning. With the first phase of the line scheduled to open by 2029, it will be the eighth MRT line in Singapore, employing a fully automated and driverless mode of operation. The line will run from Aviation Park in Changi to Jurong, passing through residential estates such as Loyang, Pasir Ris, Tampines North, Hougang, Serangoon North, Ang Mo Kio, Sin Ming, Bukit Timah, Clementi and West Coast and terminating in the Tuas Industrial Estate. A branch line will connect Pasir Ris and Punggol. First announced in January 2013, the line will connect with all radial lines, with 13 interchange stations along its 30-odd station alignment significantly enhancing the connectivity of the rail network. In addition, it will provide an important rail link between the Central, North-East and West areas. The Western Depot will occupy the site of Raffles Country Club while the Eastern Depot will be at Changi East (Changi East Depot). The line is designed for 8-car trains, making them the longest MRT trains in Singapore, but will operate with six-car trains initially. First announced in the Land Transport Master Plan 2013, the 50-kilometre Cross Island Line traverses the island from East to West, relieving congestion on the existing East West Line and Downtown Line and opens up new transport corridors for central Singapore regions. The line will serve Changi, Loyang, Pasir Ris, Hougang, Ang Mo Kio, Sin Ming, Bukit Timah, Clementi, West Coast and the Jurong Industrial Estate, with a branch line extending from Pasir Ris into Punggol. In January 2019, Stage 1 of the CRL was announced, comprising 12 stations from CR2 Aviation Park to CR13TE7 Bright Hill with 4 of them being interchange stations with existing lines. The station code is CR1 reserved for a potential future extension to Changi Airport. While the Eastern end was announced to be at Aviation Park in January 2019, the line may be extended to “potentially Changi Airport” (with Station Code CR1), as quoted from Minister for Transport Khaw Boon Wan. Engineering Studies for Phases 2 & 3 of the Cross Island Line are still being conducted as at January 2019. In February 2014, LTA called for a tender for Engineering Feasibility Study (Contract C1002 – Engineering Feasibility Study for the Proposed Cross Island Line) which was awarded to Arup Singapore Pte. Ltd. for S$7,988,000.00. As part of the engineering feasibility study, the possibility of operating Local and Express services on the same line was considered. For the Cross Island Line, an option for express train service between Jurong East and Changi Airport was assessed. However, in a written reply to a parliamentary question by Mr Ong Teng Koon on 19 Nov 2018, questioning if there were plans to implement express trains in new MRT lines, Minister for Transport Khaw Boon Wan mentioned that “less than 5% of CRL users will see significant time savings of at least 15 minutes”. With the higher costs and land involved in boring additional two tunnels for the express service, the option will not be exercised by LTA. 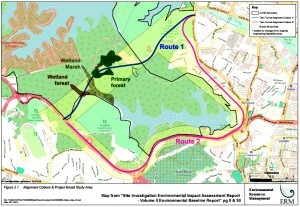 The alignment of the Cross Island Line through the Central Catchment Nature Reserve was the subject of much public debate, with nature groups and members of the public voicing their concerns about such an arrangement. 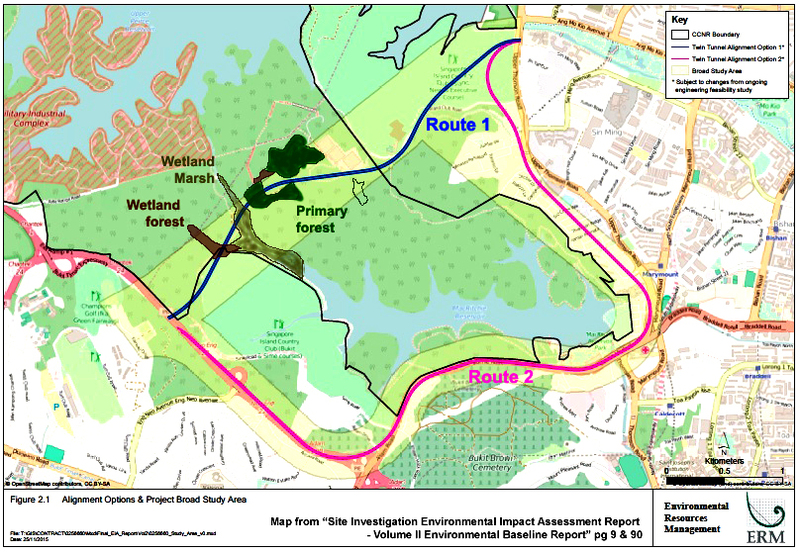 A direct alignment would see the line tunnelling underneath the Nature Reserve, while a skirting alignment would see the line diverted around the reserve via Lornie and Upper Thomson. An Environmental Impact Assessment (EIA) was carried out from August 2014 to End 2016 to study both possible alignments. Soil Investigation works began in March 2017. The final alignment will be decided will only be decided at a later date, after soil investigation works are completed. In a written reply by Minister for Transport Khaw Boon Wan to Mr Gan Thiam Poh regarding a Parliamentary Question on whether an extension can be made on the Thomson-East Coast Line (TEL) to connect to Pasir Ris and Punggol, there is no plan to extend the TEL to Pasir Ris and Punggol. However, LTA is studying the feasibility of extending the proposed Cross Island Line (CRL) to serve these areas. Engineering studies for the Pasir Ris – Punggol stretch of the CRL are ongoing as at February 2019. 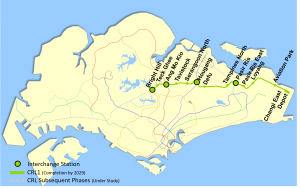 Construction for the first phase of the Cross Island Line starts in 2020. All Station Names, other than the Interchange stations, are working names. The Cross Island Line will charge distance-based fares as set by the Public Transport Council. All train and bus journeys in Singapore can be paid for with contactless stored value smartcards. Passengers can also purchase single journey tickets with cash, sold at General Ticketing Machines located in every station. Adults, Children, Students, Senior Citizens, National Servicemen, Persons with Disabilities and Workfare Income Supplement recipients can use their respective concession cards to enjoy fare discounts. Trains on the Cross Island Line will comprise of 6-cars each, with a possible expansion to 8-cars.